For five of the ten years that I spent working as an advertising copywriter in London, David Abbott, who died yesterday at the age of seventy-six, was my creative director. It was David who first taught me to write. The gift was given generously and graciously. Almost as if by some mysterious form of osmosis. It involved little in the way of techniques and tools. 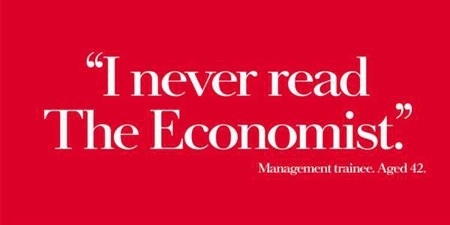 Except for the advice that the best time to write an Economist poster was on a Sunday evening with a glass of red wine. He told me too, when I finally left AMV to attempt to run a creative department myself, that I would find it impossible to make people produce good work and that I should be content instead only to prevent them from doing bad work. There was even less in the way of formal criticism. He led by example and by encouragement. High standards were set in the clear expectation that you would first meet them and then exceed them. Why else would he have hired you in the first place? Interviewed many years later by Tim Bell at the IPA he said that the only environment in which it is really possible to produce your very best work is in your own agency. And that the reason for AMV’s quite spectacularly consistent success was that it was founded, owned and managed by three people who shared the contagious qualities of trust, respect and affection. It was certainly the only place that I have ever worked where the three partners were only ever spoken of by their first names at all times and by everyone. And also no doubt the first and last plc in history that had no formal ‘HR Function’. Nor any need of one. My partner then was Rob Oliver, an art director of exquisite taste and talent and a Welshman of tinder dry wit. It was David who introduced us and who encouraged us to overcome our initial mutual suspicion. And it was Rob who subsequently described our working lives there perfectly. It was, he said, like working in Rembrandt’s studio: “the master paints the faces and the hands and the rest of us fill in the sky and the clouds”. That David was the most talented British copywriter of his generation is beyond dispute. The work that he leaves behind speaks today with same persuasive eloquence and economy as the day it was written. And now that the craft that he made his own is pretty much all but done I think that we can probably simply say that he was the best there ever was or that there will ever be. There was much to learn from him too, and from Peter and from Adrian, about how to conduct yourself in business and in life. And I guess that’s where I should really have been paying a bit more attention. The simple truth is that kindness costs nothing and often pays back handsomely. But it’s a rare quality in any business let alone one as brutally competitive as advertising. Stories of his, and their, quiet acts of kindness abound and for my part I still have the handwritten note posted to my parents’ address in Scotland the day after my father’s death: ‘come back when you’re ready’ he wrote. I still have his back copied letter resigning the RBS business when he felt that the work that Rob and I had done had been rejected unfairly and unreasonably. It is a masterclass in business ethics. Something that I suspect rather passed RBS management by. Even then. And facing me now as I write this I also still have a chair. It’s a bar stool in fact, from the AMV bar. It was my leaving card and beneath its brass plaque: ‘For Peter (1989-1994) Who Spent Many Happy Hours Here’ is David’s signature. And Peter’s and Adrian’s and Rob’s. Alongside those of all my then colleagues. So tonight I shall pour myself a glass of red wine and go and sit on it. And I shall remember David and all that I learned from him. And then I’ll see if maybe I can’t finally finish that Economist poster that I started on some twenty years ago in jest with Richard Foster, the one copywriter I ever met, by the way, whose talent began to come anywhere close to the master: ‘Never Send Your Dog To Fetch The Economist… ‘ it began. And maybe he will look down on me and read my efforts and half smile and say: ‘well, I suppose if that’s what you really want to do… ‘. This entry was posted in advertising, branding, commercials, marketing, uk and tagged #advertising, #copywriting, #davidabbott, #marketing. Bookmark the permalink.